While lowest in number, this was the last 10C series calculator to be introduced. Thanks to ever improving technology, this was the first series in which every model was programmable and like other early models, the owner was introduced to programming right at the front of the manual. Programming with the requisite set of keys for conditional tests, SST, BST, INT, FRAC, GTO and MEM. And like all 10C series models, it had the advantage of running for months to years instead of hours on a set of batteries. The record so far is 34 years on the original set of batteries! As you might imagine, the programming model was quite basic. Gotos went to line numbers and there were no insertion/deletion keys. For easier editing GTO.## went to the line number rather than entering a GTO into the program. Just two conditionals were provided (x=0 and x<=y). Of course, any test could be synthesized with those. There were no subroutines and no flags. 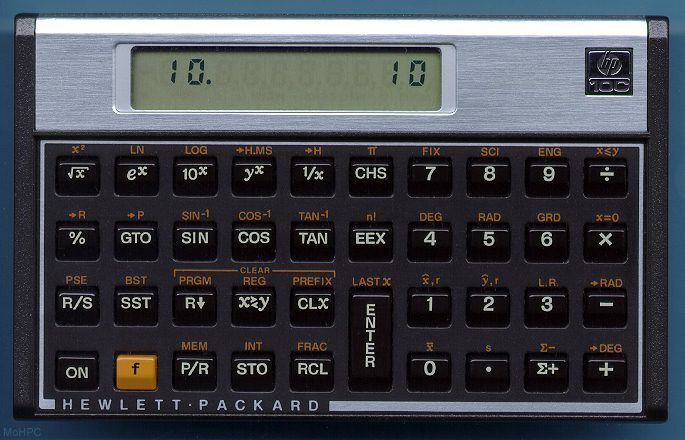 The HP-10C started out with 10 storage registers (R0-R9 with the statistics functions also using R0-R5.) Only 9 lines of program space were reserved but as programs grew longer, registers at the top (R9) were automatically converted to program space allowing a maximum of 79 program lines with no storage registers. "Remember the HP-35A? A revolutionary concept in 1972. An "electronic slide rule" with one register, no programming, and -- oh, yes -- a nice, soft, black leather case. All this for the "affordable" price of $395, factory list. And, it was as hard to find at dealers as it was to get delivery from HP. Yet . 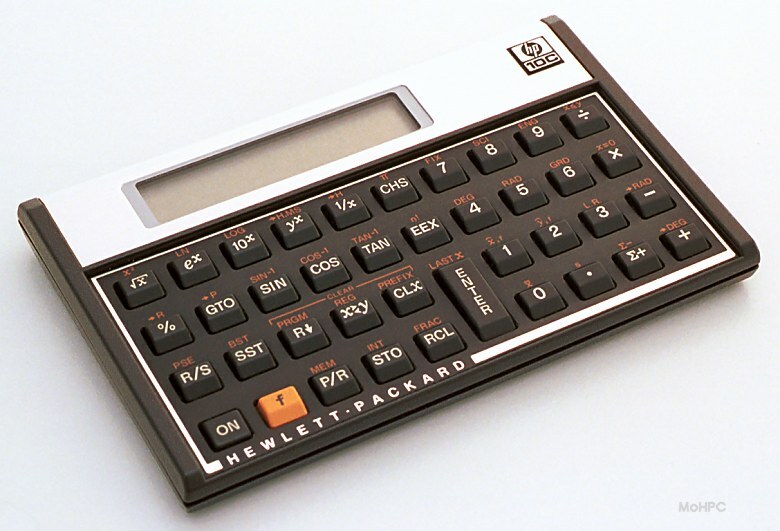 . . had the electronic computer industry gone the way of inflation instead of each generation of calculator getting more powerful and cheaper, a calculator like the HP-35 would today cost $740. But the programmable HP-10C -- with 79 lines of program memory that can be traded off for 10 registers -- is at least 10 times more powerful than the HP-35. Just think: assuming the inflationary process mentioned above had become reality, and if the relationship between power and price were linear, the HP-10C would today cost over $7,400! Instead of such a horrible fate, the HP-10C lists for a small percent of the HP-35's original price. So it is indeed the least expensive programmable ever produced by HP."